…shows that the Quran is far from being a masterpiece, or the pinnacle of Arabic eloquence. The wrong use of a word in a very crucial text which relates to the nature of Allah is clear proof that God is not the author of the Quran. To achieve this end, the missionaries cite an online text from a Christian Arab polemicist who claims that the word does not mean “one”, but “one of”. Is it true what they claim? We seek to answer this allegation in the following, insha’allah. 1 Does “Ahad” really mean “One of”? Does “Ahad” really mean “One of”? 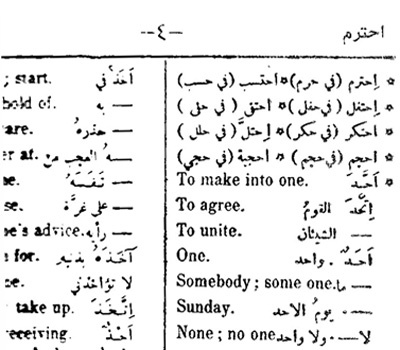 Amazingly, the actual Arabic of verse 1 does not say that Allah is One, but literally says Allah is One of. This is due to the word used for one in the sentence, namely ahad. What is actually “amazing” in this statement is their extreme idiocy and ignorance with regard to the meaning of the word “ahad”, which is actually an adjective, as opposed to “one of” which is a pronoun. The missionaries in their haste to twist the meaning of “ahad” has failed to distinguish between these two obvious opposites! First, let us refer to the established meaning of “ahad” as established by the lexical authorities. 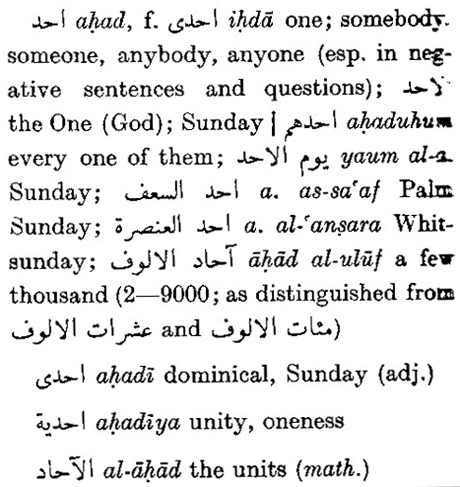 Note that the meaning of “ahad” varies from “one” to “someone“, but certainly they all agree on the same meaning, which is the adjective “one”, and not the pronoun “one of”! Hence we have established that “ahad(un)” does indeed mean “one” and the debate should just stop there. However, the missionary has compiled a list of verses, which he claims mean “one of“, occurring in the Qur’anic text. To add a further blow to the missionary propaganda, we produce the following entry from a Qur’anic concordance which distinguishes between the word “ahad” and “ihda“, accompanied by the Qur’anic verse numbers in where they occur. It is indeed clear from the above that the missionary has no case to follow. 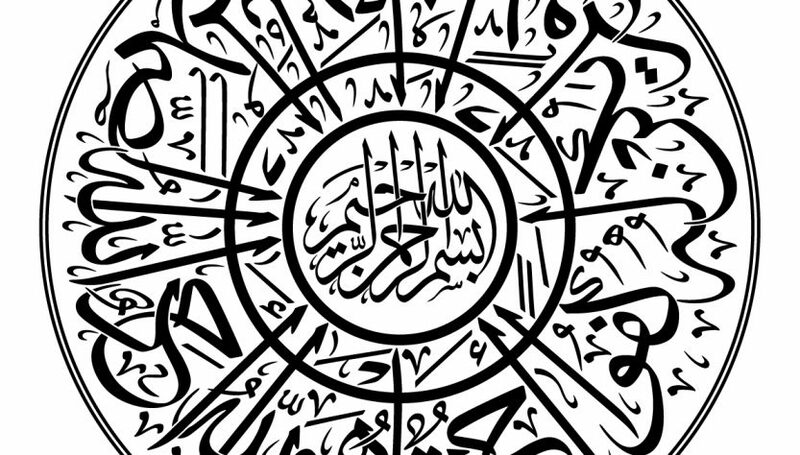 “Ahad” does indeed mean “one” and it occurs frequently throughout the Qur’anic text. Whereas the word “ihda” (which means “one of”) only occurs thrice in the Qur’an. In every single case, ahad is used to refer to one of something, to one member of a specific group. None of the examples used this word to mean one, alone, single etc. Ironically, this allegation of the missionary is only true for the very word which the missionary is trying hard to promote, i.e. “wahid“! Has the missionary confused himself? 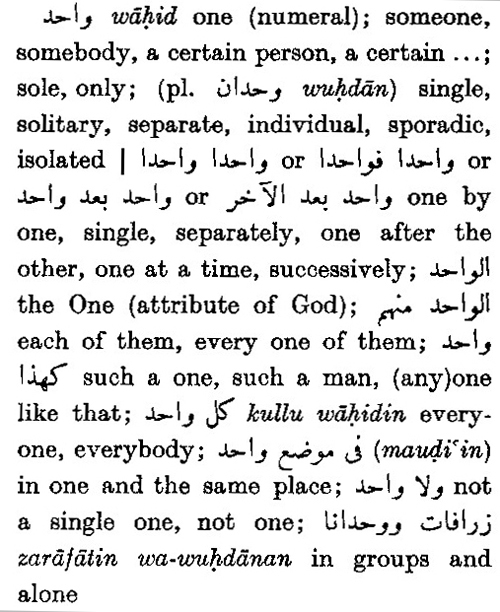 The above entry clearly states that wahid can mean “…each one of them” or “every one of them” which certainly shows that it can refer a member of a specific group. What is the missionary trying to say and what exactly does he want to achieve by this pointless polemic? With regard to the missionary allegation that “wahid” is a better substitute for “ahad”, we say that the missionary has certainly never heard this Sura’ being recited when he made this idiotic claim. To listen to Sura’ al-Ikhlas, we implore our readers to download and listen to the Sura’ recitation by Sheikh Abdul Rahman As-Sudais here [ .mp3 format]. Readers can easily note how the Sura’ is structurally pronounced and the overall tone of the Sura’ is rhythmically consistent in the usage of the word “ahad“. Hence, this missionary polemic is dismissible and can now be discarded as nothing more than inflated nonsense. One possible, and even probable, explanation as to why Muhammad, or the author of the Quran, used the word ahad is because of his interaction with the Jews. Muhammad may have heard the Jewish Shema, the monotheistic creed of faith found in Deuteronomy 6:4, recited which uses the word echad to refer to Yahweh’s unity. 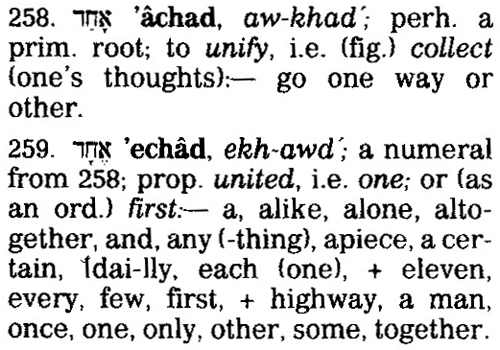 Please note that the BDB have included ahad in its entry of “echad”, and both are identified as adjectives. Unfortunately for the missionary, there is no meaning “one of” recorded by this celebrated lexicon. In any case, Muslims are in a dilemma. Since the data shows that the literal rendering of Sura 112:1 is that “Allah is one of,” the question remains one of what? Is he one of many gods? It is also equally obvious that the missionary is desperate enough to “read into” the Qur’anic text for evidence of the non-existent Trinitarian doctrine as held by Christians. Worse still for the missionary, we have shown from his own Bible that the Hebrew echad (which is also an adjective) is understood as “one” and is synonymous with the Arabic ahad, and its accompanying interpretation from Jewish scholars. There is no room for a Trinitarian interpretation for “echad“, and likewise, there cannot be any form of the pseudo-monotheistic Trinity in its sister equivalent, “ahad“. And only Allahu Ahad knows best. anyone who study arabic will know that the KHABAR AGREE WITH THE MUBTADAH IN GENDER AND IN NUMBER. The Christian missionaries did get me on one point: If Allah is Ahad, then why is his attribute/name Al-Wahid, intead of Al-Ahad? I just don’t understand if Ahad is more “monotheistic” and singular, shouldn’t his name be Al-Ahad as well? Yet in Surah Ikhlas it says Qul-Hu-Allahu-Ahadun(Say-He-Allah-One). Notice the ‘Al’ is not before Ahad, so it’s not a title for him, but is a descriptive sentence. If it did mean ‘one of’, it would be Arabic ihda,which occurs 11 times elsewhere in Qur’an. I do agree with you that the Hebrew Echad = Arabic Ahad. They both mean ONE nevertheless, and are not comparative. Al-Wahid seems to be more like ‘The Unified’ instead of Al-Ahad, ‘The One’. SubhanAllah! Not only is the word ‘ahad’ more rhythmically and aesthetically pleasing, it adds further depths and layers of meaning not given by its synonyms. This demonstrates the miraculous accuracy, eloquence and masterpiece of the Qur’an. The missionaries lies and falsehood are revealed again.